Tactical belt W/two pouches - tan. 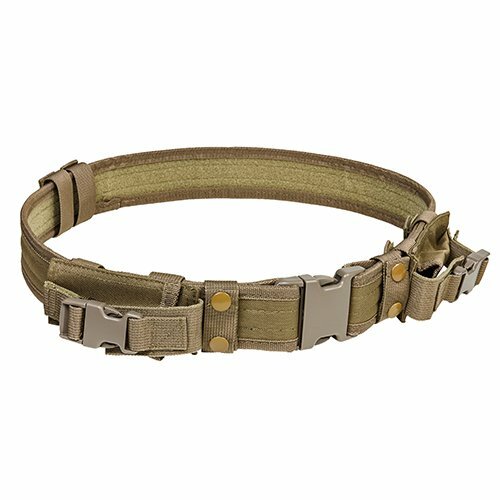 Features: - 2.25" tactical belt with large quick connect buckle and with two horizontal magazine pouches. The tactical belt is ajustable for waist sizes 32" to 49" via hook and loop fasteners. - the tactical belt is a great accessory for your holster, magazine/dump/utilty pouches, and drop legs accessories. - includes two Removeable pouches with quick connect buckle flap. Suitable for double stack magazines, folding pocket knife, Multi-Tool, and other essential gear. Secured to belt via hook & loop straps. - features a large plastic 2.25" quick connect belt buckle. - inside of belt is lined with 1.25" soft loop fastening material, for hook and loop accessories. Includes: - two Removeable pouches - 4 snap button belt keepers. - specifications: - color: tan - fits: waist sizes 32" to 49"
If you have any questions about this product by NcSTAR, contact us by completing and submitting the form below. If you are looking for a specif part number, please include it with your message.